Summer is a time for road trips. If you live in Wisconsin, many of those road trips will involve stops at Kwik Trip. Since opening its first location in 1965, the La Crosse-based convenience store chain has expanded rapidly and now has a presence in almost every Wisconsin city and township (except Milwaukee for some reason), with more than 400 locations in its home state. Along the way, Kwik Trip crossed the Mississippi River into Minnesota, where the chain currently has approximately 150 more locations in 95 cities, and new stores on the way soon. Adding to the Midwestern convenience store’s flourishing empire is a strikingly similar—but noticeably different—Kwik Trip variant that exists only in Iowa. Strangely, billboards for Kwik Star actually start in Wisconsin. We noticed the marketing changed once we passed the southwestern Wisconsin town of Cuba City (which, yes, has a Kwik Trip). About 20 miles away from Dubuque, we were still technically in the Badger State, but we had clearly entered Kwik Star country. Soon, we crossed a long steel bridge that stretched across the mighty Mississippi, leaving both our home state and its ubiquitous convenience store chain behind in favor of something new…but strangely familiar. A few miles outside the northern Iowa hub’s brick-laden downtown, we saw it—the unmistakable visage of distorted reality in the form of a regional gas station. We found the bizarro world Kwik Trip. Instead of telling you what we saw once we reached the summit, we’ll show you what we found inside the Iowa-based Kwik Trip analog and document any differences we were able to find. Each has the same font, titled lettering and lines added to the first letters of each word in the name (to imply speed? 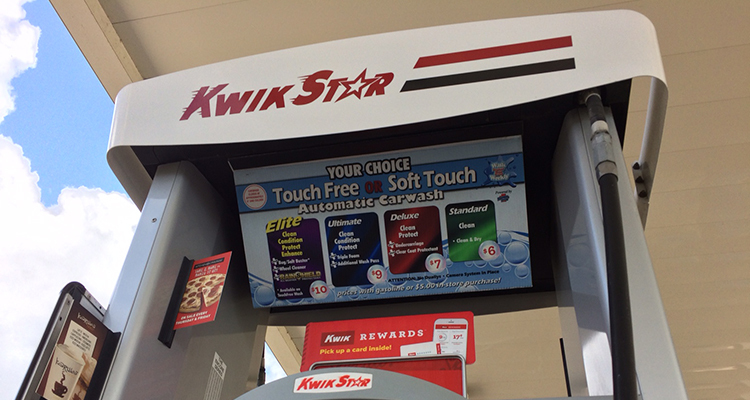 ), but Kwik Star eschews use of the letter A in favor of a red and white star. Other than the different name, the pumps look the same. There’s the same black, red, and white color scheme. Both push Cheese Mountain pizzas (same name across the board) and the identically-named Kwik Rewards card/ap. 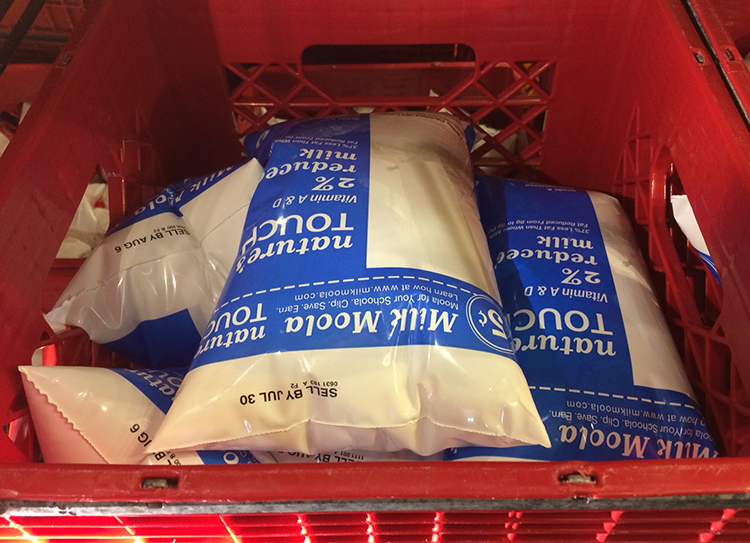 Both offer the same selection, including the chain’s famous selection of Nature’s Touch bagged milk. 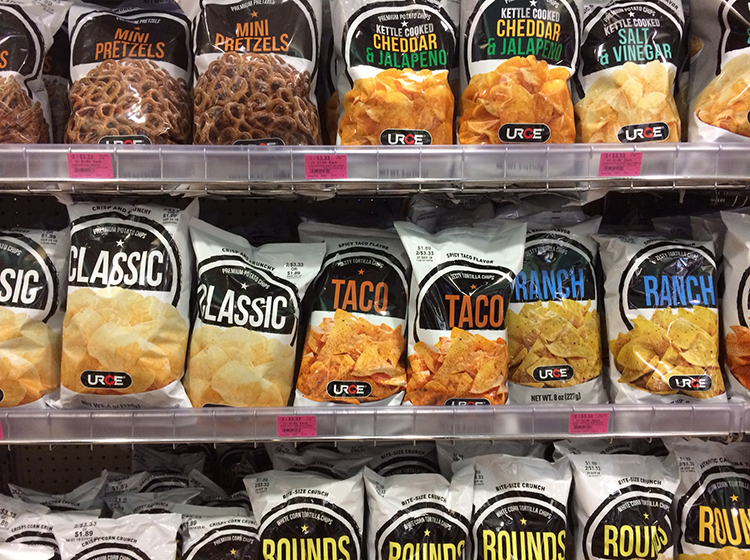 It’s a different state and new name, but Urge continues to dominate the snack section at Kwik Star. Same goes for Urge brand pizzas and candies. 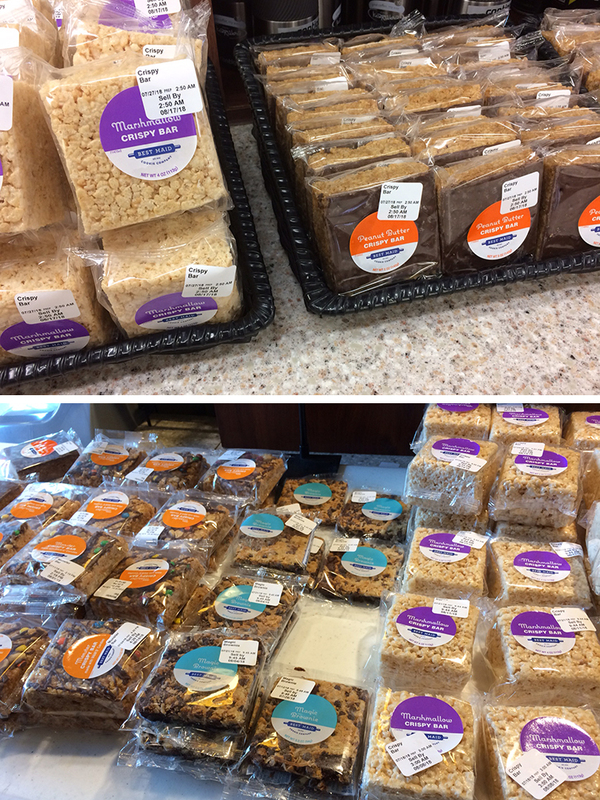 The Kwik Trip in Johnson Creek and this Dubuque Kwik Star each offered some of the corporation’s in-house “Best Maid” branded sweet treats, including the “Crispy Bar,” but Kwik Star (lower photo) had a much better selection than the paltry two types of desserts available at that particular Wisconsin gas station. Bakery good fortunes were reversed with Kwik Trip/Star’s often-touted Glazer donuts. Both places had them and the identical $1.99/half dozen special (which was repeatedly pushed by cashiers in Iowa), but the Wisconsin gas station also offered a deal for a dozen donuts, as well as a chocolate-drizzled option that wasn’t available in Dubuque. Exactly the same. Both were abundant, privy to prime placement, and well-stocked with items at loss-leader prices. No matter the business’ name or what state it’s in, Cafe Karuba reigns supreme as the store’s in-house coffee. The Dubuque location only offered four types (to the six we got to choose from in Johnson Creek), but we suspect the difference is on a store-by-store basis and not state-to-state. The same. We were even surprised to see some Klement’s brats and breakfast links also made the trip from Milwaukee to Iowa. Outside of the name, the walk-in beer cooler brought about the most notable differences between locations. The Wisconsin Kwik Trip we’d visited had an entire display devoted to Spotted Cow and other varieties from New Glarus (which cannot be sold outside of the state). Meanwhile, the Dubuque Kwik Star offered beers from Iowa-based breweries like Toppling Goliath (which, yes, can be found in Wisconsin), Exile, and Millstream Brewing Company. That Kwik Star also sells Potosi, which is brewed in nearby Potosi, Wisconsin. Though it’s a Wisconsin beer, we can’t recall ever seeing any types of Potosi on sale at Kwik Trip. We suspect this Stone Cliff Wine—made right in Dubuque—is probably unique to Kwik Stars. That’s probably for the best. While there were some slight differences between the two (Kwik Star also has its own branding on bags, for instance), we must admit that Kwik Trip and Kwik Star are essentially the same thing. It probably didn’t warrant a drive to Iowa and back, but we can now say with absolute certainty that a wide-reaching local chain that holds such a special place in Wisconsin’s heart can, in fact, be successfully replicated elsewhere. As we neared that same steel bridge that would bring us back on the familiarity and simplicity of Wisconsin and its endless menagerie of Kwik Trips, we saw an 18-wheeler that was emblazoned with clear lettering and that unmistakable Kwik Trip logo. It was no doubt returning to Wisconsin after a Kwik Star delivery. At that moment, it hit us. Even though the local convenience store has spread to other states and has taken another form along the way, it all starts and ends in right here in Wisconsin. And that means something. Or maybe it doesn’t mean anything and we just drove to Iowa for a very dumb reason. Whatever.